panting our house!, originally uploaded by roses&pearls. We got the house painted this month. We had a lot of help from neighbors and friends. I love the colors we picked. (Thanks to you Brenda and all the thought and searching in that direction.) 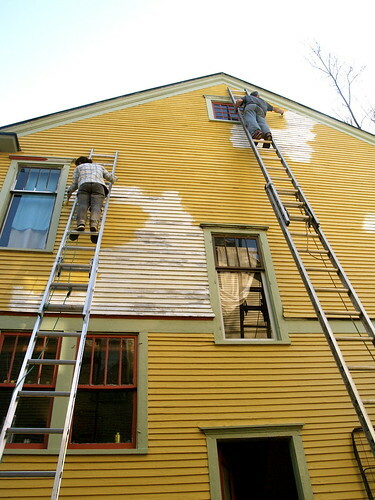 We really needed to get this done because not only were the current colors drab but the exterior was really getting ragedy from weather and sun which was just about to turn the corner towards some serious damage to siding and trim. There is something about scrambling all over every inch of your house that leaves you with an appreciation and understanding of the place where you live. I am so glad we didn't have the money to pay some one else to do the work that was rightfully ours to do. Poverty truely opens the door to heaven and keeps it swinging.